How often can you relate to the above picture? Are you the one who’s hauling bags and bags of crazed shopping from the car? Or are you someone who cannot stand the crowds and noise? 1) Lists: There are some people, like me, who absolutely love lists. I have a list for what lists I need to make. Make a clear list of what you need. For example: you need black pumps. You get to the store and see a great handbag, so you venture out into that section. three bags, a couple of make up items and 10 clothes later, you stagger home only to realize that the pumps you need, are still at the store! A great tip that I have been actually following is: I have a large post-it note on the inside of my closet (in the bit of clear door space that I could manage to find). Whatever I NEED, and I mean need, not just want, I write it on the Post-It. Whenever I go shopping, I just grab my Post-It and stick it onto my phone, and then keep referring to it while shopping. 2) Closet Cleanse: While shopping for food, it’s always advised that you shouldn’t go on an empty stomach. Similarly, before heading to the mall, open your closet and stare at it. try and indulge in some cleaning – remove out a few tops, give away a few jeans. if there are great clothes, in excellent condition, try selling them on EthnicThread. That way you can even earn a few bucks before spending them. Guilt free shopping we say! But honestly, when you go to the mall, after looking through a ton of clothes, you’ll be less likely to shop like crazy. It’s like your eyes have already seen a lot of clothes and sent signals to your brain that “it’s enough!” Trust me, you wont ‘binge shop’ when you closet cleanse and go shopping. 3) Budget: Unless you want to spend unlimited money, make a budget. Don’t punish yourself by setting a weird, unattainable budget, but make a realistic one. It’s okay to go slightly over your set budget, but budgeting helps to keep your shopping in check. 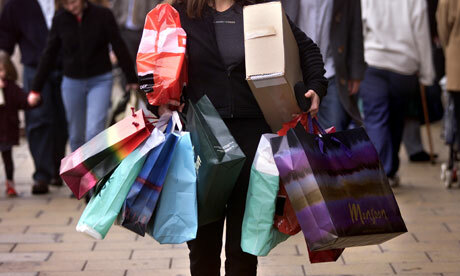 4) Shopping Buddies: Decide whether you want a shopping partner. I like to take along friends who are quite critical and discerning, and also whose taste I like. No point in taking along a friend who loves wearing bohemian chic, while shopping for formal office wear! There are also times when I like to shop alone, without any inputs or opinions of others. decide what you like best, and go for it! 5) Time it well: Personally, going during the rush hour irritates me. I hate to shop when people are elbowing me for an outfit, or asking me, “are you buying that?” Choose the time you go and shop well. Also try and make sure you have time on your hands to shop. Merchandise that’s most expensive will be stored near the escalators / lifts, and stuff that’s just as good, but less pricey is stored at the absolute ends. So take your time, browse around and then make choices. 6) Have Trust Issues: With the sales people. Sales people are there to make a sale, so while they are nice and helpful, they won’t necessarily be honest with you. So salesperson at the makeup counter will say that you look like a vampire with that red lipstick, or a fashion salesperson won’t say that you look like a penguin in those pants. 7) Maintain your style: Remember what kind of clothes you like to wear. Don’t indulge in impulse buying, because you might not want those Aztec pants, or that sweater with the concentric print that’s been hypnotizing everyone around. Maintain your style while shopping, don’t buy things because they are there. Also do a thorough quality check before buying a garment. 8) Trials: Please please please try everything on. We know it’s a pain, and extremely annoying to wait in that large queue but go into that trial room, and try the clothes on. Pose in front of the mirror and click a selfie, look at it, and decide whether it really suits you. Check the fit, the seams and the style before you actually go and pay for it. 9) Last Minute: It’s ideal that you don’t wait until the absolute last minute to shop. Especially for big events. You would definitely know quite well in advance if your sister’s getting married, or it’s Christmas! Start scouting for clothes quite well in advance, even a couple of months. I know many people who buy clothes last minute because they want to lose weight! Well, it’s not like you can’t alter clothes! it’s so easy to find an alteration tailor near you, where ever you are located by using the EthnicThread app. It’s also quite possible that last minute deals are in fact a lot more exorbitant than the regular prices. 10) Sale Sale Sale: Be scared of sales, very very scared. A sale will always make you buy things you never knew you wanted! That being said, a sale is a good time to look around, and see if you can find a good deal on something that you would need later – like a good winter jacket during a summer sale. But it means that if you buy that winter jacket, you will be wearing the previous season’s pattern. It’s not like patterns change heavily so if you are comfortable with that, you must buy that jacket. But if you are someone who doesn’t want to be seen in last season’s hair clip, this might become a small issue for you. A good idea is to buy classic items on sale, so that you don’t end up being too out of fashion! There goes! Ten tips from the professional shoppers…..